Optical fibres are the backbone of the National Broadband Network (NBN) and high speed network connections due to their fast data transfer rates over long distances, especially when compared to copper cables. Our society in general is becoming increasingly reliant on high speed communications for many aspects of day-to-day life that are now commonplace. They are also used in a host of other applications such as sensors and lasers, resulting in the even more widespread usage of optical fibres. While basic optical fibres are based on thin silica fibres or polymers, others are more specialised and require doping with precise amounts optically active elements. The concentration of these dopants across length and cross section of the fibre can affect their properties. System like the TESCAN LYRA, S8000G or S9000G are perfect examples of Ga FIB-SEMs that cater for ToF-SIMS integration. 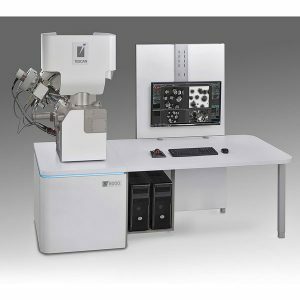 The SEM with large field of view allows rapid location of areas of interest and imaging. The FIB also enables depth profiling to be carried out on the samples in situ providing an added analytical dimension.